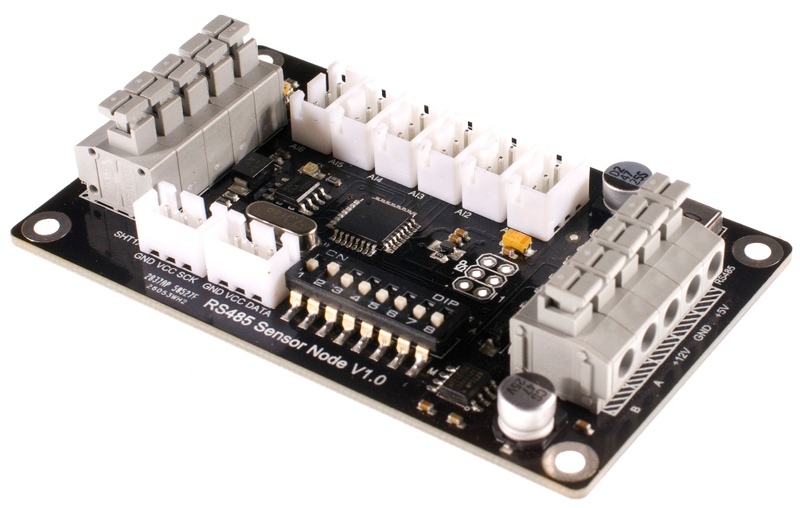 This RS-485 Sensor Node module can be used in various applications such as intelligent agriculture, environment monitoring,home automation...etc. It is a Internet of things device. 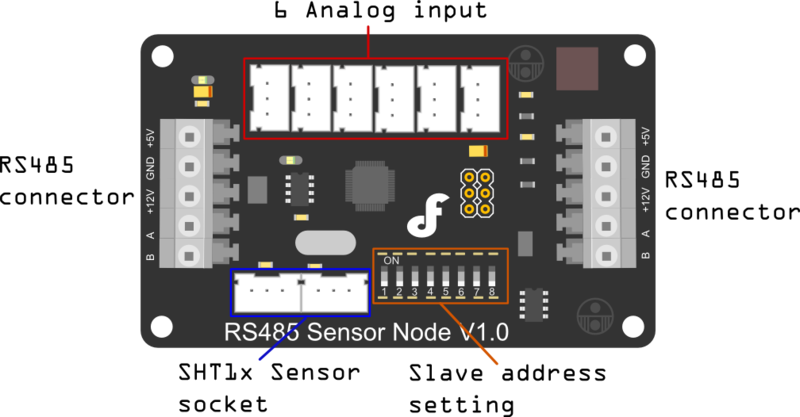 This RS-485 Sensor node provides 6 channel analog input and 1 SHT1x Humidity & Temperature digital input. The RS485 protocol supports up to 254 nodes at 1200m distance between each node. This allows a wide range cover for monitoring the environment. A screw free design allows easy connection of cables without scarfice reliable & stable. RS-485 standard is used effectively over long distances and in electrically noisy environments. Multiple receivers may be connected to such a network in a linear, multi-drop configuration. These characteristics make such networks useful in industrial environments and similar applications.RS-485 enables the configuration of inexpensive local networks and multidrop communications links. It offers data transmission speeds of 35 Mbit/s up to 10 m and 100 kbit/s at 1200 m.
RS-485 bus is the most popular communication method in industry. Compared with RS-232 bus, it is able to transfer information in further distance with lower cost. Establishing an “Internet of Things” by integrating RS-485 with Ethernet, which is the widely available in the world, in the hope that this method will coordinate all devices with low cost and high efficiency. Auto or manual operation: This bit is for setting the addresses of slave devices by software or hardware. A: set slave address via software, when it is at the A side, the Bits for setting slave address will be invalid. M: set slave address via hardware, when it is at the M side means you can set the slave address via the 7 small switches.Success to set after 30 seconds. This command will check all data of current device.There are 10 register data totally.A register data is 16 digit,consisting of 8 high digit and 8 low digit. According to new device address,model will return 0x55 after address set successfully; In manual status,sending 0x55 can't set current device address,if the product can set device address manually and automatically.Then, the return value is 0xFE that illustrates product in manual setting address status. this sample is used for setting device address as 0x11. 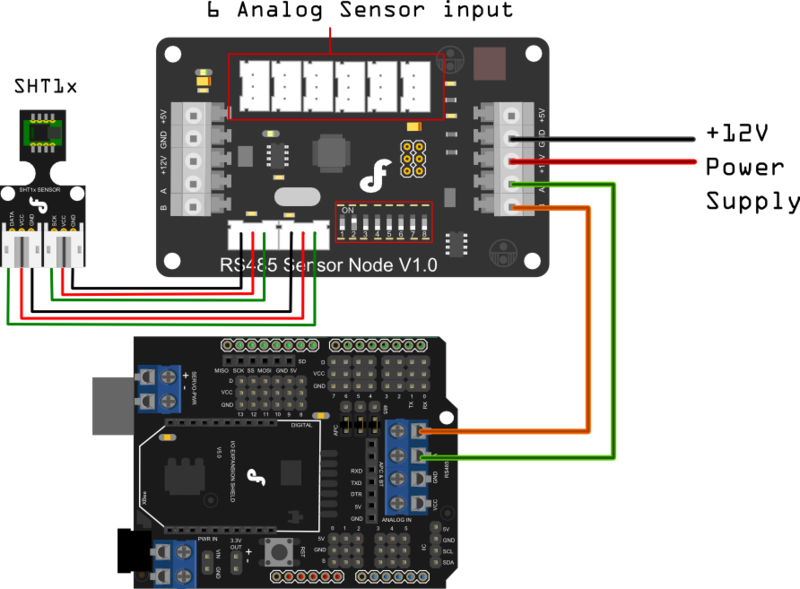 Get RS485 Sensor Node V1.0 SKU:DFR0233 from DFRobot Store or DFRobot Distributor.